The Players are just finishing up Spelljammer Adventure 8: The Kidnapped Dwarf and Higgimus wants to work out how to get a Dragon Turtle out of it's shell. Ideas so far are, chopping off the head, tail and legs and using wooden wedges to lever the back of the shell off of the underside and mounting a spelljammer helm to the back of the shell and using the helm to try to lift the shell off. Using vermin to eat away the Dragon Turtle meat has also been discussed, but AuldDragon seems to have said there are no insects on Green Shield. just to be clear, is the goal to keep the shell intact, or do you just want a lot of turtle dragon meat in one piece or something? i will mainly be operating from the assumption that you mainly want the shell, not the meat. anyways, i'm not sure what resources you have available in your current situation. in theory, you could try something like using a flesh to stone spell to make getting the insides out less... icky... and then turn it back with a stone to flesh. you may find this whole thing easier with the assistance of the enlarge/reduce spell. enlarge a person to be able to dig out more dragon turtle, reduce the dragon turtle so there is less stuff to remove. you may be able to summon something useful (summoning a 10 foot cube swarm is a level 2 spell for wizards, with a duration of "as long as the caster concentrates" from what i can tell, shadow monsters is level 4 and would merely require something capable of tunneling with sufficiently low hit dice to get in reasonable numbers (have you seen any giant ants, perhaps? ), and priests with the right sphere can summon insects as a level 3 spell, though i'm not at all sure your priest will have the animal sphere). you could also try blasting it right through the middle with a lightning bolt. or several. obviously, this carries some risk of damaging the shell though. and, uhhh... don't stand too close while trying that. Sadly, we came to the situation with the spellcasters needing to use their spells for other things. We did manage to remove the top of the shell eventually, but bad dice rolls got an NPC crewman killed and a couple of rescued slaves injured. We ended the day tired and with both NPC helmsman unable to fly and took off to find ourselves in major trouble with no spellcasters free to defend us. I hope it turns out to be worth it! I wish they had, just so I could force saves and/or Dex checks for flying turtle shell debris. We were intending to cut pilot holes and then use levers, but then Braxon used the button on the rod that turns it into a magical axe and chopped three quarters of the sides away (Auld wouldn't let me get to the rear of the turtle that was in the water). After that, we went back to the levers and then used the captured Barge of Ptah to flip the shell off. 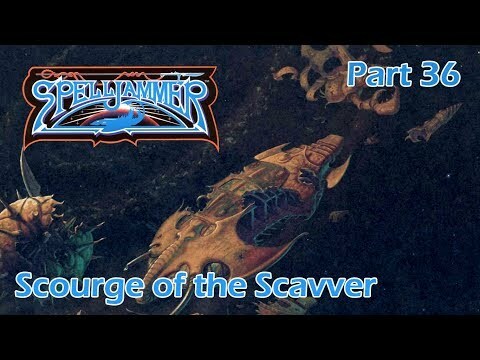 AuldDragon renamed his Spelljammer: Adventures in Arcane Space videos on YouTube, to make it easier for people who want to jump into the middle of the show and catch up. They are now divided into eight adventures (with more adventures to follow as we do them). The forth adventure is now called: Spelljammer Adventure 4: Scourge of the Scavver. If you like watching this adventure, and want to see more the fifth adventure is called: Big Trouble in Little Shou. Other adventures are now listed in the original post. I would genuinely rather have the individual playlists linked. I've started following again now that summer is over. I'm on the first episode of Higgimus' Geas. Did I hear you guys talking about Golarion? Is there a crystal sphere with the Pathfinder setting in it? One player assumed "Pathspace" was the Crystal Sphere of Pathfinder, but it isn't. There is no canonical Golarion crystal sphere, and I don't know enough about the setting to include a fanon version in my campaign. There is information about Golorian's solar system on Pathfinder Wiki. I've got Children of the Void which introduced the worlds, but not Distant Worlds, which expands those worlds. I think that Pathfinder's solar system could be rebooted, as a Spelljammer crystal sphere, but the newer Starfinder material moves further away from Spelljammer than Distant Worlds did. I think I'd rather see Spelljammer's patchy canon built up, at this time, than see non-Spelljammer things given a makeover. But that's just me. I'm sure other folks would enjoy a Pathfinder/Spelljammer crossover. I've been listening to some of AuldDragon's older episode's on YouTube recently. Anyhoo, this lunch break I got to Skulking Below Part 13. We had just gone to the break, before opening a small door at the end of a dog-leg corridor. My PC (Braxon Miacc) has develped a suspicion of closed doors and sometimes pushes them open with a foot before backing off. I had the feeling this would be a "HAMbush" so got Braxon to kick the door open and back off. Auld clarified what I was doing and I was VERY careful to point out that Braxon was NOT going into the room. The player who plays Higgimus (the giff fighter) pulled out a gun and tried to take a potshot at one of the people in robes in front of an altar. ...and IMMEDIATELY got hit by the HAMbush. A ton of undead rats fell on top of him and tried to nibble him to death! I had to keep muting myself, because it was so funny that he walked right into it.